Monitoring the performance of websites based on the end user’s experience isn’t a new concept. For years, website owners have recognized the need for continual monitoring on the Web from their customers’ perspective. Not only are site owners held accountable for high availability, they also appreciate the correlation between performance, the user experience, and business outcomes. In the world of digital interactions, the margin between success and disengagement or abandonment is measured in milliseconds. Measuring performance is not a new concept to mobile either. However, mobile performance has historically been synonymous with voice quality, and only the concern of mobile telecommunications companies. Today, with the exploding adoption of advanced smartphones and tablets, companies are taking a mobile-first approach to engaging with customers and employees. And as these mobile initiatives are delivered at increasingly rapid rates, the quality and reliability of the mobile apps, mobile web and connected services that support them has become critically important. For the technology teams delivering customer and employee services in the mobile channel, it is important to understand that performance monitoring solutions which work for the desktop cannot be simply applied to mobile. Managing the mobile end user experience requires an understanding of the challenges posed by the complexities of the mobile environment. Accurate and meaningful monitoring, measurement, and understanding of the mobile end user experience demands approaches that manage this complexity. 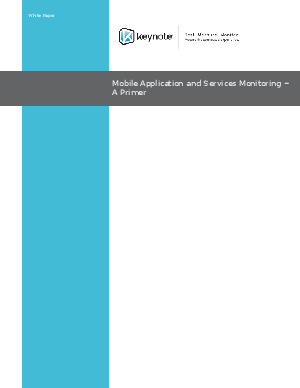 This paper will explain the challenges and opportunities of assuring mobile app and site performance, plus offer strategies for accurately monitoring mobile end user experience.